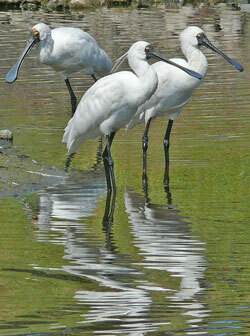 Habitat: Originally a salt marsh, the area that is now Westgate Park was mined for sand in the 1930’s before it became a rubbish tip for over two decades. 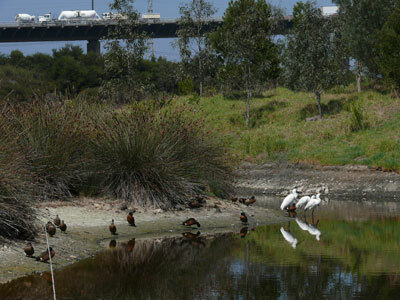 Development of the park from a wasteland into a 54 hectare wetland and parkland area commenced in 1984, as part of Victoria’s 150th Anniversary Celebrations. The area surrounding the two lakes, one saltwater and the other fresh, has been revegetated with native plants, and more recently with indigenous plants that represent various ecological vegetation communities of the coastal region to the south east of Melbourne. 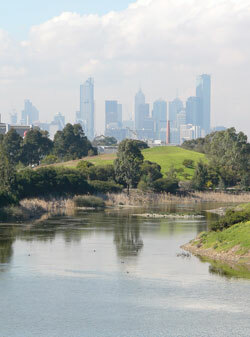 The park includes a short section of Yarra River frontage at the end of Lorimer Street where a range of water bird species, not found elsewhere in the park may be seen. A very active group of volunteers, the Friends of Westgate Park and Parks Victoria are continuing to undertake revegetation works to improve the habitat for birds and other wildlife in the park. Black Swan; Grey Teal; Chestnut Teal; Pacific Black Duck; Australasian Grebe; Rock Dove; Spotted Dove; Crested Pigeon; *Little Pied Cormorant; Purple Swamphen; Dusky Moorhen; Eurasian Coot; Black-winged Stilt; Black-fronted Dotterel; Silver Gull; Rainbow Lorikeet; Superb Fairy-wren; White-browed Scrubwren; White-plumed Honeyeater; Little Wattlebird; Red Wattlebird; New Holland Honeyeater; Australian Magpie; Little Raven; Magpie-lark; Welcome Swallow; Common Blackbird; Common Starling; Common Myna. Australasian Shoveler; Hoary-headed Grebe; Australian Pelican; Eastern Great Egret; White-faced Heron; Australian White Ibis; Royal Spoonbill; Black-shouldered Kite; Little Eagle; Nankeen Kestrel; Australian Hobby; Masked Lapwing; *Crested Tern; *Pacific Gull; Galah; Musk Lorikeet; Little Lorikeet; Purple-crowned Lorikeet; Spiny-cheeked Honeyeater; Grey Fantail; Willie Wagtail; Little Grassbird; Silvereye; European Goldfinch.